For both companies, this includes a level 1 cache on the chip itself (8 KB on the 80486) and the integration of the FPU (floating point unit, a math coprocessor) into the CPU itself. FPU integration eliminated the bottleneck when moving 64 or 80 bits of data between the CPU and FPU over a 32-bit data bus. As a general rule of thumb, the 486 offers two to two-and-a-half times the performance of the 386 at the same clock speed. (Likewise for the Motorola 68040 vs. the earlier 68030.) This actually let companies release lower clock speed CPUs with better overall performance. Byte magazine (May 1993) notes that the 486 has a MIPS (million instructions per second) rating of 20 at 25 MHz and 54 at 66 MHz. This comes out to about 0.8 MIPS/MHz, which is 2.4x the rating of the 386DX (0.33 MIPS/MHz), although we must keep in mind that MIPS is not an accurate pedictor of real world CPU performance. The original 80486, also known as the 486 DX (and sometimes DX2), has 1.2 million transistors using 1 micron technology. This includes the CPU, FPU, and data cache in a single chip. Speeds ranged from 25 MHz to 50 MHz. The 486 can address 4 GB of RAM and 64 TB (terabytes) of virtual memory. The core of the processor runs at twice bus speed. A more powerful version, the 486 DX4, runs the processor at three times bus speed. This shipped in 75 and 100 MHz speeds. 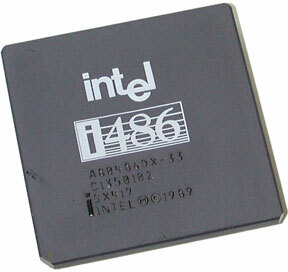 As with the earlier 386 family, Intel also released a lower cost version of the 486 and dubbed it 486 SX. The 486 SX was deliberately crippled by disabling the FPU, but the integrated cache still made it a decent performer. It was also clocked at lower speeds than the 486 DX: 16, 20, 25, and 33 MHz.